Besides the PhD Program is also open to the different departments of Basic Sciences and the Dept. of Humanities and Social Sciences. PhD in the following disciplines - Electrical Engineering, Electronics Engineering, Mechanical Engineering, Civil Engineering, Computer Science and Engineering, Chemistry, Physics, Centre of Excellence Theoretical & Mathematical Sciences, Mathematics, Humanities and Social Sciences, Management, Hotel Management, Medical Science, Pharmaceutical Sciences, Centre of Biotechnology, Centre for Biomechanics, Law. PhD students will also be admitted to different centers such as Center of Excellence in Theoretical and Mathematical Science (CETMS), Center of Nano Science and Nano Technology, Center of Biotechnology, Centre for Bio fuels and Bioprocessing and others. CETMS is primarily focusing on conducting advanced theoretical and experimental research. The applicants must have any of the following degrees at the time of application. ME / M.Tech. /M.Pharma. /M.Phil/MHMCT/MHA/LLM/MD/MS/MDS/M.Sc. (Nursing) or equivalent in relevant discipline with a minimum of 6.75 CGPA in a 10-point scale or 60% of marks in aggregate. B.E./B.Tech./B.Pharm/MCA or equivalent in relevant discipline with CGPA of 7.75 or 70 percent and above marks in aggregate and one publication in a reputed National Journal and one in reputed International Journal and minimum work experience of 2 years. Scientist or researcher from National Laboratories/industry and more than 10 years of research experience, two papers Publications (One in National Journal and one in International Journal) with 6.75 CGPA or 60% in aggregate. MBBS (Medical Science with 6.25 CGPA or 55% of marks in aggregate; M.Sc. /M. Phil in Clinical Psychology with 6.75 CGPA or 60% of marks in aggregate. BDS (Dental Science) with CGPA 6.75 or 60 percent marks in aggregate. M.Sc. in Physics/Chemistry/Mathematics/Biotechnology and other related disciplines with CGPA 6.75 or 60 percent marks in aggregate. M.A. in English/Economics/ Library and Information Science/Literature with CGPA 6.25 or 55 percent of marks. MBA/ PGDM/ (AICTE approved)/ M. Com./ MA in Economics/ PMIR/M. Tech industrial Eng./ Public Administration, with 6.75 CGPA or 60% in aggregate (Only for Business Administration). 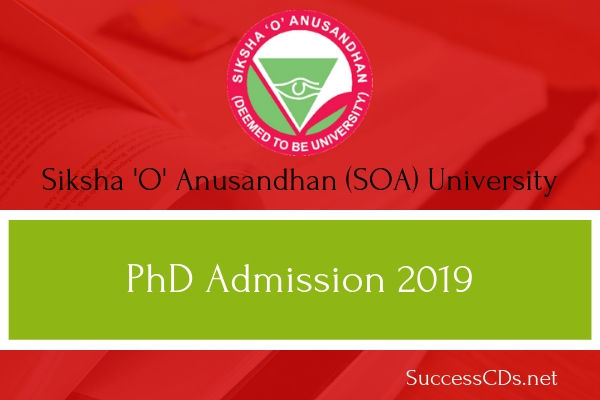 **Applicants can find the further details like Eligibility Criteria, Selection Process of Siksha 'O' Anusandhan University PhD Admission 2019 on the official website www.soa.ac.in. PhD (Full –Time / Part-Time) - Fellowship of Rs.20000/‐ per month will be awarded to deserving full time research scholars. SOA University PhD Admission 2019 - How to Apply? Interested candidates for full time research scholars can apply to SIKSHA ‘O’ ANUSANDHAN UNIVERSITY through online mode only. An applicant can apply online University Website www.soauniversity.ac.in; after submission of the form; please check your email (as entered in the application form) for application copy. Enclose Demand draft of Rs.1500/- in favour of Siksha ‘O’ Anusandhan University, payable at Bhubaneswar. Send the application form to Dean Research, Siksha ‘O’ Anusandhan Deemed University, Institute of Technical Education and Research (Campus), Jagamara Post, Khandagiri, Bhubaneswar, Odisha-751030. For details and instructions, please visit Siksha ‘O’ Anusandhan University website www.soauniversity.ac.in.